We practice Eco –friendly Recycling Techniques for various sources of Lead Scrap. 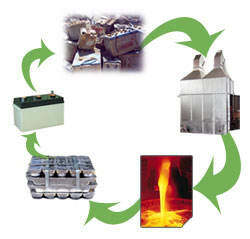 We import Scrap Battery Plates / Battery Scraps for production of Remelted Lead. Our Lead Recycling plants employ Pyrometallurgical processes. Typically, in this process, Lead bearing materials are charged into a furnace together with appropriate fluxes & reducing agents. Reduction of Lead bearing material to crude Remelted Lead takes place along with the formation of Lead bearing slag. The slag may be collected and smelted in a separate slag campaign in the same or another furnace. The process employed, furnace combination, fluxes, reductants etc. are finalized taking into account the required plant capacity, required product mix, pollution control plant and environmental concerns, the desired level of flexibility in plant operation and the composition of available battery scrap. The molten metal and the dross are removed from the blast furnace by tapping operation into moulds or ladles. Normally the furnace metal is directly cast into ingots and these ingots are allowed to solidify. If required the metal is tapped directly into a holding kettle which keeps the metal molten for refining. Local exhaust ventilation is provided for lead fumes and dust emissions at the lead and slag tap, launders, moulds, ladles, and refining kettles. This exhaust is taken to bag-house. Thus the system is Eco-friendly in all aspects.